The first win was the thing which the African nation was looking forward to a very long time. It should have boosted their confidence and morale for play further in the hope of clinching the T20 series. The next battle is to happen on Monday in Harare. Last year too, the situation was pretty much same. Zimbabwe lost the ODI series in 2015 but performed very well in the T20s. It appears to have the same as the Chevrons have already lost their ODIs and now eyeing the shortest format of cricket. It has now become their fight for the self-respect. This kind of discomfort feeling has been with the Zimbabwean cricket as they haven’t been able to perform the satisfactory majority of the times. The malaise has grown to such an extent that even the home audience wasn’t able to hide it for long and showed their concern verbally. Zimbabwe appears to have gathered some pride, which it had lost with losing the three one-day games, with the first win in the T20s. In the first T20, Elton Chigumbura scored an unbeaten half century. With his contribution, the team was able to a good score of 170 runs. The team scored much more than what they weren’t able to do in 50 overs in the first three ODIs. On the contrary, India failed to carry its winning momentum in the T20s. Despite having some good batsmen in the lineup, India failed to achieve the target set by Zimbabwe. In the end, India fell short of just two runs from celebrating the event. The recent time has been bad for Zimbabwe as it failed in the series against Afghanistan and Bangladesh and even failed to make its entry into the Super 10 stage of the World T20 2016. The victory in the last game will boost their confidence for sure. It should do the trick of winning the support of home crowd for the captain Graeme Cremer. The skipper and interim coach will be aware of the fact that their team has taken the first step towards the big objective. If Zimbabwe gets to win the T20 on Monday and it means the winning of t20 series will become the history as it has never won any of the series yet. It will be a moment to cherish for them. 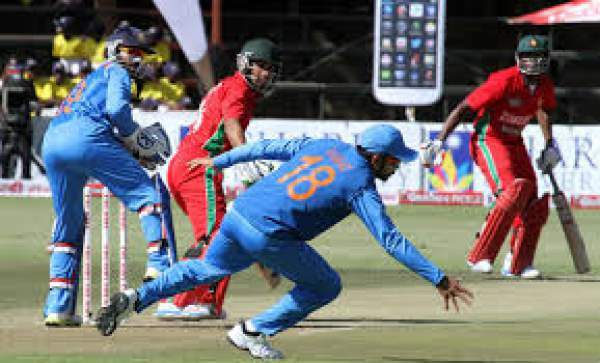 Coming to India’s context, then the loss against Zimbabwean cricket team should be like a wake-up call for Indian cricket team although it’s experimental squad. Team India shouldn’t get overconfident after winning the ODI series as they young players have a lot more to do. MS Dhoni and selectors should make changes to supplement the growth. Do replacements if it requires. The skipper of men in blue wasn’t satisfied with the performance of the team in the first T20. The star batsman of the ODI, KL Rahul who scored 196 runs in three ODIs got out for zero. Manish Pandey scored the highest 48 runs. Dhoni didn’t seem comfortable with the performance of the middle order batsmen. Don’t forget to come back for the IND vs ZIM match result, highlights, full scorecard, man of the match, etc. Stay tuned to The Reporter Times for latest cricket news and other sports updates. Share it on social media sites.